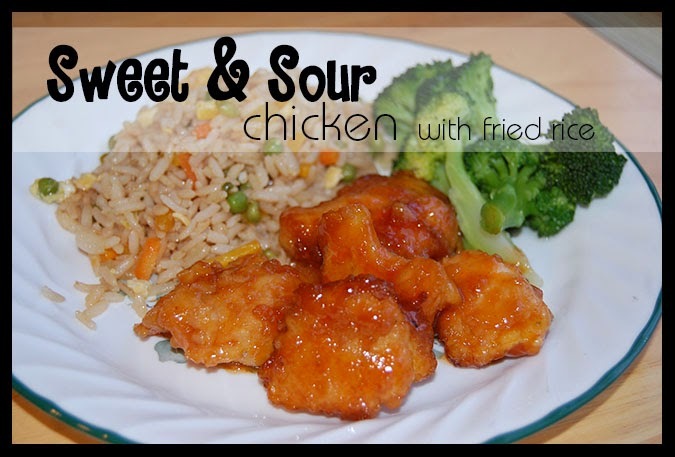 A Cooking Bookworm: I Pinned, I Made: the BEST Sweet and Sour Chicken...with fried rice! I Pinned, I Made: the BEST Sweet and Sour Chicken...with fried rice! I really do love Pinterest. It is full of great inspiration, from amazing recipes to beautiful crochet patterns to free photography tutorials to lovely wedding ideas. When I saw this Sweet and Sour Chicken recipe from Holly over at Life in the Lofthouse, I decided to make it almost immediately. I have never tried making Chinese at home, aside from an occasional stir-fry, and this was absolutely fabulous! Tasted just like our favorite Chinese restaurant! My young children called it 'China Chicken' and were cheering when we still had leftovers for a third meal!! And the leftovers tasted just as good as the first time. I barely remembered to take a picture, we were so busy eating and mmm'ing. The hubs said to just take pictures of our empty plates. The recipe takes a bit more time than I usually spend preparing a meal -- not terribly so, but you have to dredge, dip, and brown the chicken before finishing it off in the oven. I had doubled the recipe, so it took me awhile, having to pan fry in several batches. The fam is already asking when that will be...! So, head over to Holly's blog to find the recipe!